This is a larger view of the cover illustration for my new illustrated poetry book, 'Bees, Seas, Birds and Trees'. 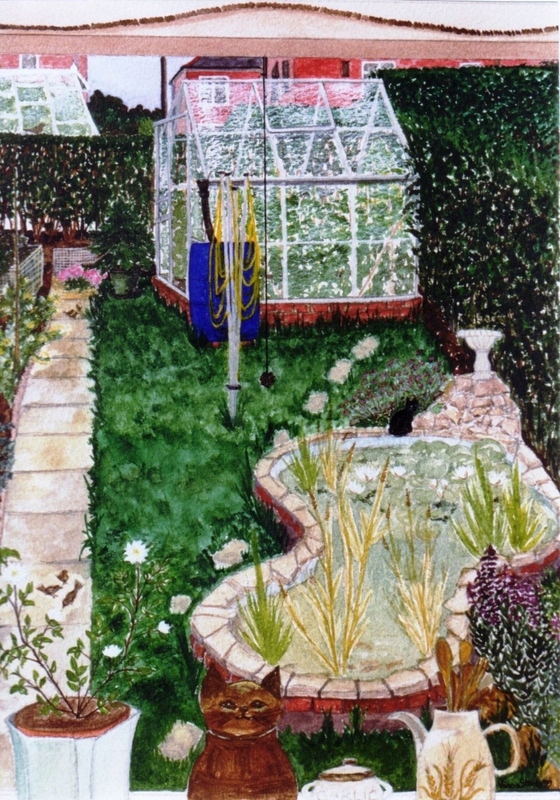 It was painted from the kitchen window of our last house when I was recovering from an operation. You can see I am looking through the ornaments/pots on the kitchen window sill and at the top is the blind with a cord hanging down through the painting. For the book illustration I have added certain graphics, including a bee, butterflies, a goldfish, a hedgehog, a bird, watering can, two fountains and a lookalike, superimposed cat over my cat, Miffy, who can be seen sitting on the edge of the pond. As it was painted in the summertime, you can see that the greenhouse is full of tomato plants and the lawn looks like it is quite long and needs mowing. Whenever I look at this painting which hangs in our lounge, I am transported back to the late 80s and although it was started in 1989, I didn't actually complete it until 1999.